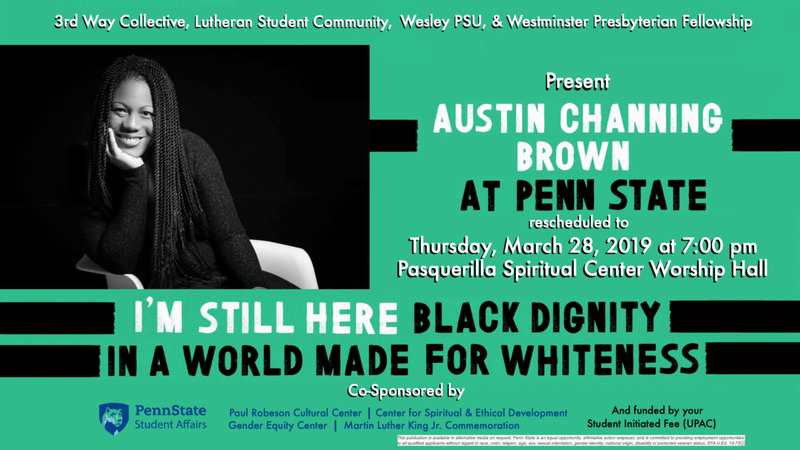 We’re rearranging our usual Thursday routine in order to host author and speaker Austin Channing Brown at Pasquerilla Spiritual Center on Thursday, March 28th. Austin Channing Brown’s book I’m Still Here: Black Dignity in a World Made for Whiteness will engage you in new and meaningful ways. There is a dinner for students at 5 pm prior to the keynote – Contact Alicia Anderson ara2@psu.edu if you’d like to join the group. Space is limited, so act soon! The public Keynote address will be at 7 pm in the Worship Hall at Pasquerilla Spiritual Center.